Red Font Civil War Veterans, C.S.A. PLEASE NOTE: These pages were created many years ago with Netscape Composer. Over time, the formatting on this page has gotten out of whack. I will work on tidying it up in the near future. This this outline is based on the information provided by researchers of the Raysor, Stokes, Risher, Walker and related families, from census records, The Christian Advocate, published obituaries, death records, cemetery transcriptions, veteran records, newspaper articles, Bible records, and family notes. Recent research indicates that Michael Raysor, Sr. migrated to South Carolina with his son, Michael, and Hannah, who is believed to be his daughter.. Thanks to all for sharing! If you find anything in this outline that is in error, please let me know! Father, Benjamin Risher. Mother: Mary Fontaine. Married about 1796. July 21, 1861. Recommended for promotion to Lieutenancy because of wounds February 18, 1862. Victoria Raysor. No evidence of a Clifford or Victoria elsewhere, so this may be an error. lists a tombstone for S.H.S., wife of G. W. Raysor. See George Washington Raysor obituary. +William H. Mellard, April 26, 1859, Ridgeville, South Carolina. He died prior to 1865. ........................ +2nd John Elliott Thames, b. Dec. 23, 1823; d. Dec. 26, 1893; buried Magnolia Cemetery, Charleston SC; He m.
Taliaferro’s Brigade, December 1864. See Henry Chalmers Raysor obituary. d: March 03, 1901 in Allendale, Fact 1 Buried Swallow Savannah Cemetery, Allendale, SC. .............................4 Sarah Elizabeth "Sally" Raysor, b. Aug 30, 1882, and died Feb. 1978 in Dorchester Co, SC. ........................ +Agnes Oliver b: abt. 1847 in Charleston, SC; m: 1901-1910; Fact 1: Mentioned in his Obit as "Mrs. Oliver"
Fact 1: Residents of Spartanburg, SC at time of car wreck. ........................ +Charles Mitchell Hiers b: October 17, 1843 in Allendale, South Carolina d: March 14, 1926 in Allendale, SC. Cavalry Regiment; died April 19, 1871 at St. George, South Carolina. Note: Mentioned in the Chalmers Raysor obituary are a brother, Clifford Raysor, and sisters Lola Raysor & Victoria Raysor. No evidence of a Clifford or Victoria elsewhere, so thismay be an error. Brigade, December 1864. See Henry Chalmers Raysor obituary. Fact 1 Buried Swallow Savannah Cemetery, Allendale, SC. ................................4 Sarah Elizabeth "Sally" Raysor, b. Aug 30, 1882, and died Feb. 1978 in Dorchester Co, SC. died April 19, 1871 at St. George, South Carolina. Fact: Medical Doctor and ordained Methodist minister. Buried Sunnyside Cemetery, Orangeburg, S.C.
Mary Elizabeth Moss; Buried Sunnyside Cemetery, Orangeburg, S.C. Buried at Old Zion Methodist Church Cemetery, Bamberg Co, SC. Buried Sunnyside Cemetery, Orangeburg, S.C.
................................4 Benjamin Hart Moss, b. Jan. 17, 1862; d. April 22, 1939; m. Agnes Dibble; Judge in Orangeburg County, SC Court. ................................... +Mattie Mandeville Rogers b: in Darlington, SC ; No children. .................... 3 Laura Anne Raysor b: December 15, 1832 in South Carolina d: June 23, 1883; buried Antioch Cemetery, Allendale, SC. .....................................+Harriet Eliza Killingsworth, b. February 1, 1846; d. April 4, 1927. Buried Antioch Cemetery. ................................4 Rennie Erwin, b. February 15, 1866; d. January 1, 1887 in Allendale, SC; Buried Antioch Cemetery. .................... 3 Alfred William Raysor, MD; b: March 24, 1829 in Colleton County, SC; listed on census of Colleton Co, SC 1850 as a student. Place of Burial found by a land surveyor 2002. He died Aug. 29, 1898 Jefferson County, Florida. ..............................4 Thomas George , b. Sept. 1, 1859, Jefferson County, FL. Fact 1: Buried Isham Walker Family Cemetery. Fact 1: Buried Isham Walker Family Cemetery, Colleton Dist. Fact 1: Jefferson Rifles, Co. H, 3rd Florida Infantry. Buried Isham Walker Family Cemetery, Colleton District. Fact 1: No children. Fact 2: Buried Roseland Cemetery. ............................... 4 Mamie P. May b: 1864 in South Carolina d: January 17, 1872 in South Carolina Fact 1: Twin? ............................... 4 Janie E. May b: April 11, 1864 d: April 15, 1864 Fact 1: Twin? pension, #A02338). Michael O. Raysor Obituary. Letter from Michael O. Raysor to his wife, 1863. Palmetto Guards prior to July 1, 1861; he died August 189_ (from George Raysor-John May Bible). St. George UDC Cemetery ; Mother: Elizabeth Strobel m: January 27, 1863 in South Carolina Fact 1: Buried St.
Walker Family Cemetery, Colleton Co, SC. Jane is buried Appleby M.E. Church Cemetery, St. George, S.C.
............. +Mary Ann Walker b: Abt 1819 d: before July 20, 1898; Buried in Oakland Cem, Atlanta, GA.
.........................+Dr. B. F. Treadwell; m. January 11, 1863 in Jefferson Co, FL. and retired to the Invalid Corps. He served in the Enrolling Dept. in Madison, FL for the remainder of the war. 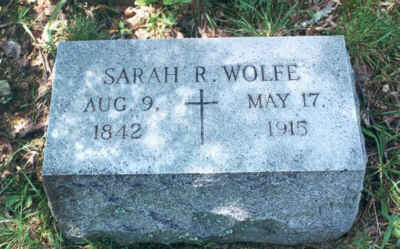 Buried April 10, 1908 in Oakland Cemetery, Atlanta, GA. See Obituary. Florida Brigade. He died Aug. 23, 1909 and is buried at Oakhill Cemetery in Quitman, GA.
...........................+Laura Hunter Lee, b. April 6, 1846; d. April 2, 1926. Buried at Oakhill Cemetery in Quitman, GA.
Infantry. He was killed at Sharpsburg, Sept. 17, 1862 at age 17. .................... 3 James Thomas Raysor b: Abt 1850 in Jefferson County, FL; Buried Nov. 16, 1898 in Oakland Cemetery, Atlanta, GA.
.............................4 Mary Ann Raysor, b. 1881; d. March 1965, Atlanta GA.
Tombstone reads, "Waller Raysor Ross"
Please note, this is not an attempt to list every Raysor descendant, but to try to fill in the gaps on the earlier generations. It is a work in progress and it may contain errors, some of which may have been in original documents or obituaries. Please don't treat it as the Gospel! On the other hand, if you have additional information on these folks, please let me know.